Back in January, when Black Panther started production, most of the cast and crew likely couldn't have known that one of their co-star's new movies would take the nation by storm. Daniel Kaluuya, who plays W'Kabi in Black Panther, also stars in the breakthrough horror hit Get Out, which has become a cultural phenomenon and a box office hit, making writer-director Jordan Peele the first African-American filmmaker whose debut earned more than $100 million domestically, with $163.2 million and counting. 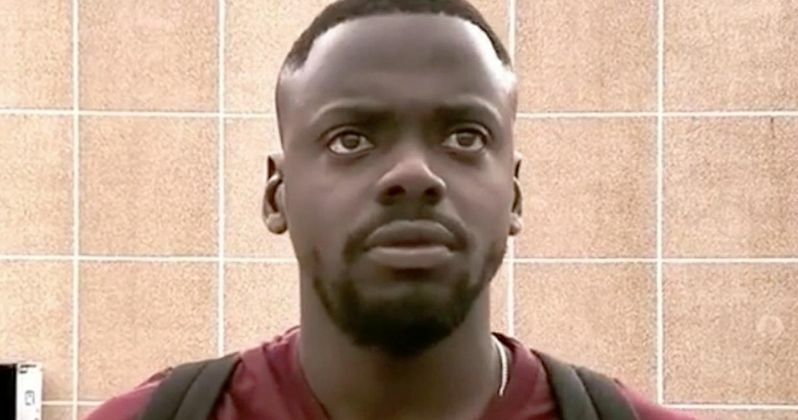 The film also spawned the viral sensation entitled the Get Out Challenge, which now has the full endorsement of Daniel Kaluuya himself in a new video from the Black Panther set. Get Out is also coming off its six nominations at for this year's MTV Movie & TV Awards, which is the highest of any movie, with nominations for Movie of the Year, Best Actor (Daniel Kaluuya), Best Villain (Allison Williams) and Best Comedic Performance (Lil Rel Howery) and Best Duo (Daniel Kaluuya and Lil Rel Howery), with Daniel Kaluuya also up for the Next Generation award as well. To celebrate all of Get Out's nominations, Black Panther actress Lupita Nyong'o decided to stage the "Ultimate Get Out Challenge" on the Black Panther set, in a video which she posted on Twitter. The video features a number of actors sprinting towards Daniel Kaluuya's Chris, re-enacting a pivotal and terrifying scene where Walter (Marcus Henderson) sprints towards Chris, only to turn away from him at the last second. It isn't known who any of these actors are who helped put this video together, by sprinting towards Daniel Kaluuya, but it's possible that they're all extras on this Marvel adaptation. The Get Out challenge was quite a big hit when Get Out was first released, but as the viral trend had started to wane, it may certainly pick up again after this video, and it's possible this trend could be revived when Get Out debuts on Digital HD May 9 and on Blu-ray/DVD May 23. Regardless of who took part in the video, it's nice to see that Daniel Kaluuya is willing to reprise his now-iconic role, even while having some fun on the set of a big superhero adventure. Daniel Kaluuya is just a small part of a massive ensemble cast for Black Panther that also includes Chadwick Boseman as T'challa, Michael B. Jordan as Erik Killmonger, Lupita Nyong'o as Nakia, Danai Gurira as Okoye, Martin Freeman as Everet Ross, Angela Bassett as Ramonda, Forest Whitaker as Zuri}, Andy Serkis as Ulysses Klaue, Letitia Wright as Serita, Winston Duke as M'baku, Florence Kasumba as Ayo, Sterling K. Brown as N'Jobu and John Kani as T'chaka. Ryan Coogler directs Black Panther from a screenplay he co-wrote with Joe Robert Cole. The film, which opens in U.S. theaters on February 16, 2018, will be shot in Atlanta and South Korea. Black Panther takes place after the events of Captain America: Civil War, following T'Challa as he returns home to the isolated, technologically advanced African nation of Wakanda to take his place as King. However, when an old enemy reappears on the radar, T'Challa's mettle as King and Black Panther is tested when he is drawn into a conflict that puts the entire fate of Wakanda and the world at risk. Take a look at this new video from the Black Panther set, featuring Daniel Kaluuya participating in the Get Out Challenge.